Join us for family camp August 16th-20th! The 2015 Bil-O-Wood Family Camp is for everyone. If you have been a camper you are welcome. If you have not been a camper you are welcome. Adults, children, families, Alumni, and friends. Come join the fun. We will share five days of camping excitement together. All prospective families are invited. 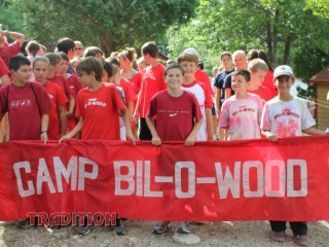 This is a great opportunity to learn about Camp Bil-O-Wood. We apologize that we cannot allow pets on the property. Thank you for your understanding. Everyone is a camper and will live in our authentic summer camp cabins. Two to three families may share a cabin, so encourage your friends to join you. Each cabin has running water, electric and most have indoor plumbing. You must provide your own sleeping bag or bedding. Cabins will be reserved on a first come first serve basis. Bring clothing and swimwear for summer fun. Prepare for warm days and cool evenings. Rain jackets and hiking boots and/or athletic shoes are recommended. Sporting and waterfront equipment will be provided. However, everyone will need their own life jacket. Your stay at Bil-O-Wood includes 3 meals per day prepared by our staff. Our program has been known for good, wholesome food and plenty of it. Meals will be served at set times and will be enjoyed in the mess hall or outside on the back hill, weather permitting. Our staff will coordinate all activities for the Family camp. Bil-O-Wood sits on Bass Lake, five miles from Blind River, Ontario which is accessible by Highway 17 from the east and west. We are 90 miles from Sault Ste. Marie and 100 miles from Sudbury. Would you like $1000 for camp this summer? If so, we have it for you! What is the BEST Gift you Could ever Give?